In newer versions of Skype (since 6.0 if I am not mistaken) the profile pictures (or avatars) are automatically being cropped down to a square. Sometimes people ask me how can they use a picture different from a square, without it being cropped. This is why I decided to make this post and share the solution. 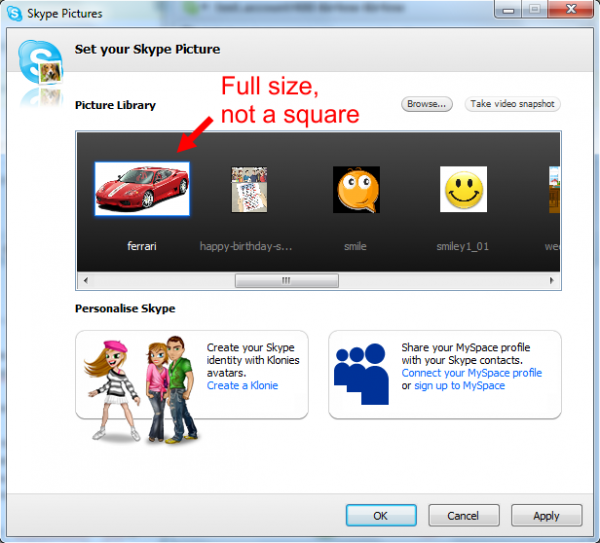 Sign in with an old version of Skype and change your avatar from there. Here I will explain the method using the portable version. This way we don’t need to deal with installations and uninstallations. Download the portable Skype 3.8. Open the portable version and sign-in. In the menu at the top go to: File -> Personalise -> Change your picture. At the top click Browse, find the picture, click Open and then Apply. Quit the portable version (and you can delete it as well if you want). Done. Continue using your normal Skype. It could take some time before the new picture starts showing to other people. Unfortunately the good old days when old skype versions work are gone.